‘So, how many eggs do you want me to prepare?’ ‘Make it two for me too,’ she said. These are some of those normal bits of morning conversations that must go on and echo around many towns and villages. ‘Don’t make them too runny,’ was followed up by, ‘I like to put some anchovies on top of the eggs on toast, and don’t want it to run off.’ The original order now came with distinct specifications. Of course, it is never too late to learn. I recently read that eggs should never kept boiling. Instead, the advice of a world renowned egg expert (Mr Heinrich von Knopfelmacher) stated; bring the egg(s) to the boil and then switch the heat off, and leave in the hot water for just 4 minutes to give you the right viscosity for the perfect egg. The egg-fluid will then resist the tendency to flow or run! Of course, a clear sign of ageing is someone sitting on a park bench, still talking animatedly to ducks, and desperate to remain a life’s enthusiast, while wearing remnants of a runny egg on his shirt, or worse, on his chin. A sad spectacle indeed. How can this joy the vivre of the aged be kept intact with visible eggs remnants on him? Still, this morning a newsflash announced that the number of people over a hundred years old will tenfold in the near future. One can imagine the egg wearing to go through the roof as well. Unless of course, the 4 minute egg boiling skill will be taught to the young and become more and more important. The ducks will just go on as ever, they are not judgemental, and have never shown any criticism of humans wearing a little egg. It might well have something to do with ducks sitting on eggs. It reminds me that my own mother always used to feed scraps to ducks. Even in her nineties she used to slowly walk to the local pond and throw the scraps. I did have to tell her not to feed the ducks the remnants of fried chicken. I mean, how would ducks feel being thrown the feathered expired AND eaten related brothers and sisters? I think she just shrugged this off. I remember her feeling sorry for a duck being stuck in ice during a very cold snap. The good news keep on coming. Aldi in Australia decided to stop selling caged eggs. However, Australia still allows eggs to be called ‘free range’ when eggs are produced by allowing 10 000 chicken per hectare of open space. One square metre per chicken! It is still cruel. In Europe the minimum is a required 4 sq. metres per chicken. The National Australian Egg-board has the largest egg producers ruling the roost. Unbelievable! Anyway, far more satisfaction can be obtained by reading a book while dipping your toast in a 4 minute egg. May I humbly ask you to buy my book, the paper-back version preferably. Overseas buyers, you can do so through the following. 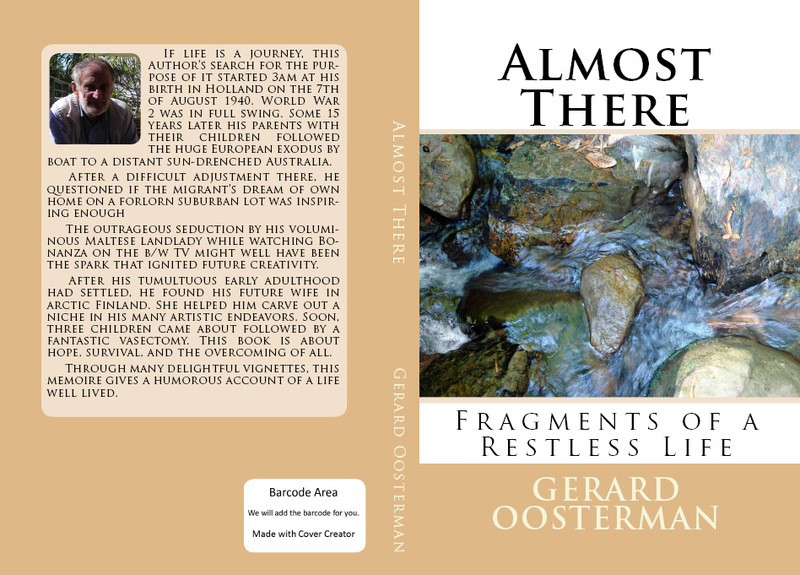 and for $17.- (including postage) you can be the proud owner of ‘Almost There.’ We are almost half way to Christmas and it would make a lovely present. A special two books for $ 30.-! After contacting me, options for payment by cheque or direct deposit will be offered. It would make for a happy man. A very happy man. Many thanks for those that have bought my book already, also for the great reviews. Can someone explain why internal and overseas postage is so exorbitantly expensive in Australia? I get charged between US$4.60 and US$3.20 per book sent by Air from the US to here in Australia, depending on numbers. Yet, to post a book within NSW cost A$7.40! But, it gets worse, a single book sent to Holland from Australia costs me A$33.40!!! What’s up with Australian Post? No wonder retailers are complaining that on-line shopping by people from overseas is too expensive due to the Aus. postage. Hmm, never tried caviar on top of my boiled eggs. On the other hand, caviar is not a stock item in my pantry. Yes, do buy the book, I can heartily recommend it. About $6 for a small jar of fish eggs and lasts well. On avocado and egg – yummy. I like them runny Gerard. Otherwise hardboiled, cold and topped with caviar !